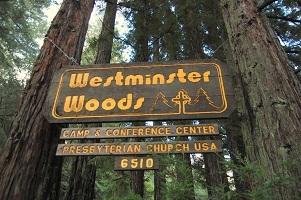 Westminster Woods is located in the redwoods of western Sonoma County, near the Russian River and the Sonoma Coast. There are many options for driving to the Woods, but we recommend the route indicated on our driving map and described below. NOTE: Using GPS, Google Maps, or other electronic tools may make your trip to The Woods longer and more confusing. Note: On weekday afternoons, especially Fridays, northbound traffic on 101 through Marin and Sonoma Counties can be extremely slow. Plan ahead -- leave early or wait until evening. Driving north on US-101, take the Rohnert Park/Sebastopol exit that says "116 West". At the light, turn left, and you're on 116 West. After about 7 miles, you'll enter the town of Sebastopol — the road will soon split, so that it becomes a one-way street. Get in the left lane, and turn left at the first light you reach. You may notice a sign pointing to Bodega Bay, or a street sign that says "Sebastopol Ave". As you make your left turn, get immediately into the right lane, and then proceed straight through the next light. You're now on Bodega Ave, which soon becomes Bodega Hwy. Take Hwy 12 West to Sebastopol, and continue straight through town as the road becomes Bodega Hwy. Follow the directions above from the beginning of the second paragraph. Take I-580 west across the Richmond/San Rafael Bridge to 101 North. Follow directions "From the South" above. -OR- Take I-80 or I-680/780 North to Vallejo, then go West on Hwy 37 to 101 North (or West on Hwy 37, right on Lakeville Hwy to 116 West to 101 North). Follow directions "From the South" above. Take I-80 to Vallejo, then go West on Hwy 37 to 101 North (or West on Hwy 37, right on Lakeville Hwy to 116 West to 101 North). Follow directions "From the South" above. Following Hwy 101 through central San Francisco can be confusing. We recommend this well-known alternate route: Take I-280 North (from SFO, take I-380 to 280 North). Near Daly City, 280 will split; you will veer left and take Hwy 1 North/Golden Gate Bridge (do NOT take Hwy 1 South). Follow the signs for 101 North/Golden Gate Bridge (best to stay in the middle lane); you'll eventually be back in freeway traffic, crossing the GG Bridge (no toll northbound). Follow directions "From the South" above. Driving south on US-101, take the Fulton exit and follow Fulton Rd. south 4 miles to Guerneville Rd. Turn right on Guerneville Rd. and follow it 5 miles until it dead-ends at Hwy. 116. Turn left on 116 East (toward Sebastopol), and go about 1 mile to a stop light at Graton Rd. Turn right. You will pass through the small village of Graton, then travel another 6 miles until Graton Rd. dead-ends at Bohemian Hwy. The town of Occidental is just to your left, but you will turn right, and travel about 3 miles on Bohemian Hwy. It is possible, but not easy or quick, to get to Westminster Woods via public transit, as long as you can come on a weekday and get a fairly early start. Golden Gate Transit (Routes 70/80/101) can get you from downtown San Francisco, or any stop along 101 in Marin/Sonoma counties, to the transit mall in downtown Santa Rosa. From there, you would use Sonoma County Transit Bus #20 to get to the town of Monte Rio, and #28 to get to the Woods. The #20 operates on weekends, but the #28 does not.